Last Saturday, I attended the Women’s March in Boston two years after Trump’s inauguration and the initial Women’s March, which drew over 175,000 protesters in Boston and millions more across the country and around the world. This year’s march was significantly smaller in scale, which can be attributed to a few factors: initial outrage to Trump has worn off, and allegations of anti-semitism have caused division within Women’s March, Inc., the New York group responsible for organizing the original Women’s March in Washington D.C. and NYC. 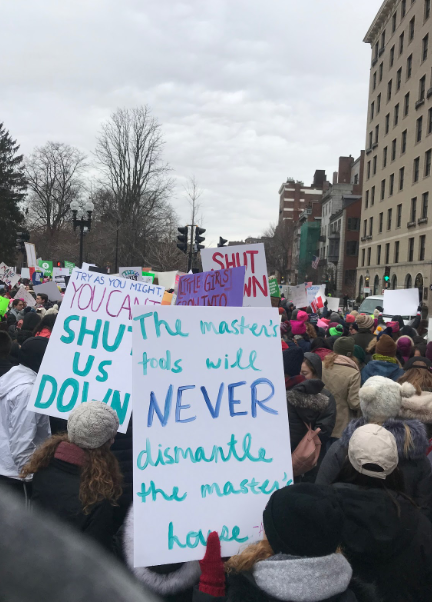 Amid the apparent division, Boston’s local organizers, March Forward Massachusetts, did an incredible job creating an inclusive, intersectional feminist rally. Rather than avoiding the allegations of anti-semitism facing the national group, Boston organizers addressed the issue head on, asserting unity in the face of division as the head of the Boston branch of the NAACP, Tanisha Sullivan, spoke together with Cindy Rowe, Executive Director at the Jewish Alliance for Law and Social Action Impact. Intersectionality was the theme of the day. This was not your typical feminist protest. Of course, there were pro-choice groups and voices calling on women to run for office. Alongside that, however, were calls to combat institutional racism, anti-semitism, gun violence, ableism, Trump’s attacks on immigrants, and discrimination against indigenous peoples. Protesters attending the march carried signs concerning climate change and capitalism, broadening the message further. The keynote address before we marched featured newly sworn-in Congresswoman Ayanna Pressley of Massachusetts 7th Congressional District, the first African-American to represent MA in Congress. She delivered a message of unity, resistance, and perhaps most importantly, progress. It can be difficult to stay optimistic in the era of Trump, but Congresswoman Pressley highlighted the electoral success of 2018 as a new wave of candidates enter the 116th Congress. Below is video of her powerful speech at the march. If you’re looking for some inspiration, I’d encourage you to watch our talented new Congresswoman who will surely be making noise in Washington for years to come. I am a man who attended this march, and I’m happy I did. In fact, I’m disappointed in myself for not showing up the past two years. One of the greatest threats to social progress facing this country is how young men are becoming embattled to feminism. Feminism is not political, and not about being a male or a female. It is about being human. I carried a sign at the march that read “Silence is Compliance.” There are many young men who are outraged at the Trump presidency, who have no explanation or excuses for his demeaning language towards women, yet so many of these men stay silent. It is not enough to merely disapprove of Trump. Men need to call themselves feminists, and more importantly, show up to support the women’s movement. To do otherwise is to look away as injustice continues in this country. I completely agree that the March should be intersectional, but to what extent should it take a position on issues like Israel? Do you think that Linda Sarsour and Tamika Mallory taking a staunch pro-Palestine stance is beneficial to the Women’s March’s principal cause? Fighting climate change, racism, homophobia, transphobia, mass incarceration, income inequality, and all that jazz should totally be included in the Women’s March’s platform. But I fear that adding a specific foreign policy position may alienate a lot of potential Women’s March supporters. I understand that being pro-Palestine is consistent with the March’s egalitarian agenda, but there are legitimate, reasonable arguments for the other side too. I guess what I’m trying to say is this: the Women’s March should totally take a stance on non-women’s issues as long as doing so won’t cause major infighting or alienate Women’s March supporters who disagree with one or two stances.